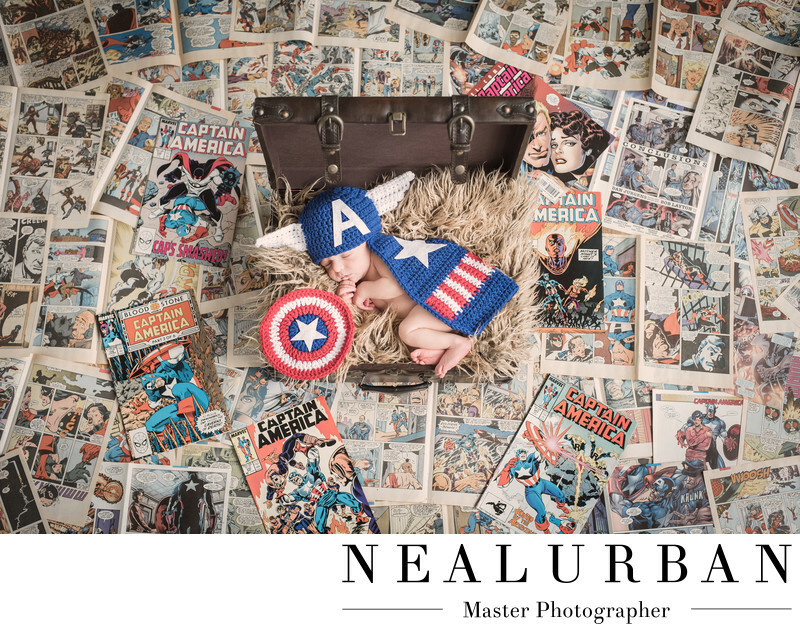 We had such a fun newborn session at Neal Urban Studio with little Nash! We had previously done photos for his parents and older brother. We did engagement portraits, wedding day photos. We took some amazing bride and groom photos near Silo City! Then maternity session at Gallagher Pier and Tifft Nature Preserve. We did a hockey themed newborn session for his big brother Niall at Neal Urban Studio. Then a camping theme for his first birthday cake smash! Now we are onto the second little boy for this family! They are really into comics and superhero characters. Mom sent over a photo of the this Captain America outfit! It was so cute. Now we had to figure out a cute idea to go with it. We came up with the comic book back ground. We went to a few different antique stores to find some comics. We tried to find as many as we could with Captain America and the rest of the Marvel Comic superheroes. I didn't realize we could not mix in DC Comic superheroes. We had to stay true to Marvel. We found the best pages in each of the comics and used all the covers we could find with Captain America on them.We placed the sleepy newborn in a vintage brief case. All superheroes have normal day jobs, so we thought the brief case was a nice touch! Then we gave him his little shield for protection. We took this shot from overhead on a ladder. We had to set this up on the studio floor. After this, we did some fun photos with his big brother and parents! We could not wait until the next family session with this family! First birthday cake smash for Nash!